The Pori Art Museum have a Maecenas system, which has been founded in 1994. It´s members comprise more than 200 corporations, organizations and private individuals. The system has made possible for us to realize projects and to reach out to various groups. The Maecenas system is based on annual cards that offer members many benefits. There are two types of cards, a personal Annual Card, and a Maecenas Card available to corporations, organizations as well as private individuals. Card holders are entitled to free admission to all exhibitions as well as other functions organized by the Pori Art Museum. The Maecenas Card is intended for corporations, organizations and private individuals. The holder of the card is entitled to free admission for him/herself and his/her group to all exhibitions in the Pori Art Museum held during the validity of the card. The museum will organize a tour of the museum and the exhibitions for a 50% discount. The card also entitles the holder to a 15% discount of the products on sale in the museum shop (catalogues, books, postcards, posters, T-shirts, etc.). The museum's lecture hall is available to the maecenas. The hall has seating for max. 60 persons. For smaller meetings, patrons can use the museum's café. The price of the Maecenas Card is €130. The personal Annual Card entitles its holder to free admission to all exhibitions held during the validity of the card. The holder is also entitled to a 15% discount of products on sale in the museum shop. The price of the Annual Card is €40. Museum card is a common entrance ticket to Finnish museums, and it is valid for one year after it has first been used. Your personal Museum Card gives you access to over 250 museums all around Finland. 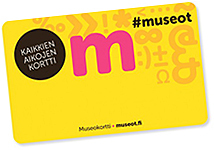 You can purchase a Museum Card from all the Museum Card museums or through the Museot.fi online store.